Is it an insult to say that somebody has a one-track mind? Usually it is, at least when phrased that way. But what if instead you claimed that someone was “really focused”, or – ooh, I love this one – “single-minded in their intensity”? Same words basically, but a different inference. Well, J. B. Summers fits that description, although he probably wouldn’t care which term you used to describe him. An insult or a compliment, it likely didn’t matter to him, which is about what you’d expect from a rock ‘n’ roll singer whose songs mostly concerned drinking, screwing and partying ‘til the break of dawn. We’ve already stated last time around with Summers how despite his rather limited perspectives shown in his songs and his delivery there was a basic need in rock to show the kind of unbound enthusiasm for living life to its fullest that existed within the community it was intended for. The young, the shunned, the universally dismissed and derided… the generation determined to break free of the shackles the country insisted on binding them in to pretend to be superior in every way, shape and form. So what if those artists and songs that often best exhibited these traits were decedent in their topics, were repetitive in their methods and simplistic in their goals? Did it really matter that what they were singing about were the very things that others often used to stereotype them and put them down as being nothing more than hedonistic revelers with no self-discipline, no moderation, no better judgement? Not if you were knowingly and willingly a part of it. So plenty of artists, from bellowing vocalists like Crown Prince Waterford and Smilin’ Smokey Lynn, to honking sax players like Wild Bill Moore and Frank “Floorshow” Culley, gleefully abandoned decorum and raised hell on record, flaunting their musical and cultural debauchery, knowing full well that – as a later white piano rocker sang – it was far better to laugh with the sinners than cry with the saints, especially when the saints wouldn’t let you into their holier than thou cathedrals in the first place. So that’s the role that J. B. Summers took on, maybe because it was the type of unhinged vocalizing he was best at, maybe because he knew that sooner or later Wynonie Harris might collapse from overexertion after hoarding all of the girls at those drunken rock ‘n’ roll orgies and would need a replacement… or maybe because Summers just liked sinning better than the other alternatives. Whatever the reason he dove into the pool fully clothed with a drink in both hands and a girl’s legs wrapped around his mid-section. Before he drowns – and presumably heads to Hell for his antics – he’s gonna tell us about all the fun he’s having, and by extension WE can be having too if we just go along with him. After all, unlike the members only reservations at those gathering of saints who sing about virginal girls and wholesome love on the pop charts, the doors to the rock ‘n’ roll party were thrown wide open to everyone who wanted to indulge in the festivities. There might not be much variations to some of these shindigs, but by the fourth or fifth drink and second or third girl of the evening, can you really tell the difference anyway? Let’s Have Some Fun Tonight! 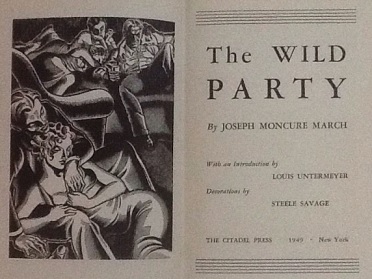 It’s not as if Summers is even being coy about his rather shallow intentions, as he comes out with a hard-charging declaration in the opening line, “Hey now, let’s have some fun tonight!” which serves as the intro, the chorus and the secret oath that all who are partaking in this party need to repeat while raising their right hand and clutching an woman’s unclad breast or pitcher of cold beer with their left. But as with the flip-side, Drinking Beer, which served the same purpose and might just as well have been the same song almost, the point isn’t the particulars of the night’s entertainment as much as it is the rallying cry FOR the night’s entertainment. Summers is perfectly cast as the slightly overeager frat house president on his own for the first time and attempting to prove his partying credentials to this roomful of fellow delinquents by being more gung-ho in his quest for drunken celebration than anyone else. Not to bring the psych class into a toga party too much here but in a sense it’s a mask he’s wearing to hide all sorts of doubts and insecurities about his ability to fit in. By being so unrelenting in his quest for the ultimate good time he’s putting everyone else on the defensive about THEIR commitment to living the high life. He’s the one setting the bar and he’s the one judging if you live up to it, when all along he’s worried that if someone else was doing the judging he might fall short. But enough about the clinical aspects of why he’s so over the top in his desire to throw up a kidney every weekend and let’s see how he can hold his booze so to speak. The basic requirement for songs like Hey Now! is to convince you that there really IS a wild bash going on in the studio and that by listening to the record you’ll experience it enough to feel a little bit tipsy from the fumes they emit alone. That’s easier said than done however because usually the surest sign that a party is hitting on all cylinders is the fact that it’s so loud, so confusing, so nonsensical that even if you DID capture that on wax it wouldn’t be understood enough to want to sit through. So Summers has to rein it in just enough to to make it coherent while still being unhinged enough to get you to believe this wasn’t an elaborate sham in the name of selling records. Not an easy task. It’s made all the more difficult because those enlisted to act as his fellow carousing band of merry men are apparently sticking with Shirley Temples while they’re being paid to play. Very responsible of them, but in this case responsible is not the attributes we need out of them. The record claims it’s Tiny Grimes and his finely tuned “orchestra” who are backing him on this, but the song itself was written by members of Gotham’s typical backing band including Harry Crafton and Doc Bagby (along with Summers himself), so who really knows for sure. Certainly Grimes has it in him to act up instrumentally, as does the stellar crew of musicians in his employ if it is in fact them. For the August session this was reputedly cut at they’ve even brought in Danny Turner on a second sax to add to the chaos, as he’s done so well on Jimmy Preston’s Rock The Joint from this past summer, and more recently from his OWN band, Chris Powell & The Five Blue Flames, who issued an even more unhinged cover version of Rock The Joint this month. But here the horns of Turner and the usually fire-breathing Red Prysock are under wraps, barely exhibiting a pulse as they throb along gently in the background. They’re not silent, but while Summers is urging anarchy they remain mostly noncommittal. Even in the sax break they’re oddly muted in their playing. Only some very ill-advised low honks, which sounds suspiciously like a rhinoceros with gas after too much red beans and rice, break up the more orderly riffs. In case you were still a little unsure of the response of hearing such an interlude, no it isn’t any better than it smells. Plus the entire backing seems strangely low in the mix, which hardly contributes to the anarchic atmosphere they need to present. Summers for his part seems oblivious to the band’s reluctance to cut loose, as he’s bellowing encouragement for all he’s worth, clapping his hands to try and spur the drummer into using his sticks for something more than scratching an itch in the middle of his back, and for awhile ol’ J. B. convinces you that this joint is a lot more rambunctious than it really is. Grimes does come along to try and help in that regard, finally playing a decent slightly mesmerizing lick two-thirds of the way through while Prysock kicks his own sax playing into something resembling high gear, but then Turner jumps back in on alto and drags it back into aimlessness. You’d think this might mean that Summers would floundering, his mask of hipness that he tried so hard to wear with a sense of dignity crumbling under unsympathetic accompaniment. You can tell in life if someone is humoring you, going through the motions, and nothing is more deflating than that, because not only does it fail to match your enthusiasm but it usually winds up making your enthusiasm seem hollow and phony. But Summers won’t say die, he soldiers on as if he expects the doors to be kicked wide open any minute by a bunch of degenerates just released from detention hall or general lock-up and give this party the shot of adrenaline it needs. It never comes but you’re so captivated by his desire to be taken seriously that you start to groove along with him. 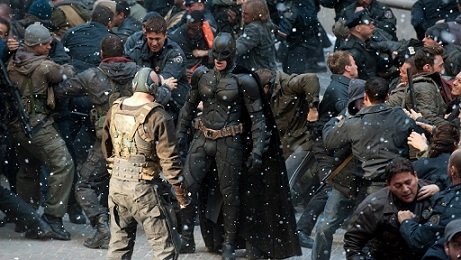 These types of forced displays of excitement never turn out well, I mean watch any huge crowd scene made of extras trying to act full of energy after five hours of shooting – see the big group fight scene in The Dark Knight Rises to witness this malady in action – and you’ll get the idea. Surely you’re too smart, too self-aware to go along with such artificial antics. Right? Wrong. Sometimes, not often but sometimes, there comes along somebody who is so oblivious to the deteriorating scenes around him, who’s so… yeah let’s say it… who’s so single-minded in their intensity that they actually turn the tide and make the whole production seem if not believable, at least plausible. Under no circumstances will J. B. Summers ever be a first tier rock star. Maybe the world could only handle one Wynonie Harris-like character at a time and since Wynonie still had claim to that role there was no need for an understudy. But even though severely limited in what he had to offer, Summers was the genuine article in that realm. He was true believer in the power of rock ‘n’ roll. 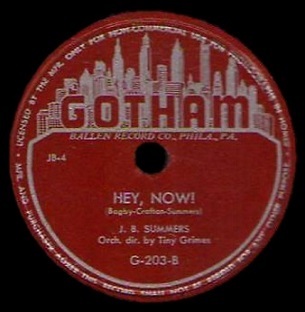 Not the artistically ambitious form of rock ‘n’ roll that maybe Tiny Grimes preferred, which might explain their going through the motions twice now behind Summers, but even if it WAS a shallow form of the idiom he practiced, on Hey Now! Summers handled his part with aplomb. In the end you kinda have to feel sorry for someone like this. A sinner in search of a party in a world still overrun with saints. But soon rock ‘n’ roll would corrupt all but the most pious of souls by which time there was no shortage of house-wrecking festivities to choose from, not just one or two nights a week, but every night, including Sundays. By then J. B. Summers would be long forgotten, maybe he went to rehab and cleaned up his ways, or maybe he drowned himself in a bottle before others came along to pop the cork off and let him back out again. Sinners ARE much more fun. Leave a reply on "J. B. Summers: “Hey Now!”"